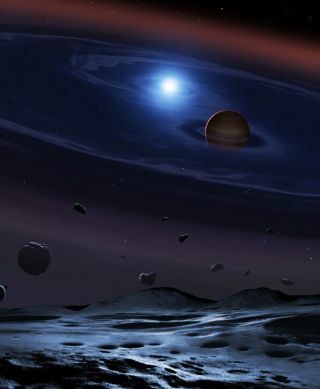 Researchers found a disk of rocky debris surrounding a white dwarf and a brown dwarf orbiting in a binary system; the two stars circle one another in just over 2 hours. Astronomers have found evidence of shattered asteroids orbiting a pair of stars, a strong new sign that rocky worlds with twin suns like Luke Skywalker's fictional home world Tatooine are possible. This finding also suggests that rocky planets may be able to survive the deaths of their stars, the new study's researchers said. Worlds that orbit binary stars, like Tatooine from the "Star Wars" universe, are known as circumbinary planets. In 2011, researchers discovered the first real-life alien world around two stars, Kepler-16b: a gas giant orbiting the star Kepler-16 about 200 light-years from Earth. So far, all known circumbinary planets are gas giants, similar to Jupiter. Scientists have debated whether rocky circumbinary planets like Tatooine are possible. "Building rocky planets around two suns is a challenge because the gravity of both stars can push and pull tremendously, preventing bits of rock and dust from sticking together and growing into full-fledged planets," Jay Farihi, the study's lead author and an astrophysicist at University College London, said in a statement.The research team discovered the remains of shattered asteroids orbiting a binary system, which suggests that rocky planets might exist there, Farihi said. Moreover, these findings suggest that circumbinary planetary systems with rocky worlds can even "survive the death of one of the stars," said study co-author Boris Gänsicke, an astrophysicist at the University of Warwick in England. The astronomers examined a system called SDSS 1557 located about 1,000 light-years from Earth. They initially thought it contained only a white dwarf, which is the dim burnt-out remnant of a star. The sun and more than 90 percent of all stars in the Milky Way will end up as white dwarfs, which have masses 40 to 90 percent that of the sun but only about the same diameter as Earth. Using the Gemini Observatory South telescope and the European Southern Observatory Very Large Telescope, both located in Chile, the researchers analyzed the spectrum of light from SDSS 1557. The wavelength of light seen from a star can yield insights on its chemistry and surroundings. The researchers detected excessive infrared light, suggesting that SDSS 1557 possessed a disk of planetary debris loaded with silicon and magnesium about 1.3 million miles (2.1 million kilometers) from the white dwarf. Moreover, they calculated that about 110 billion tons (100 billion metric tons) of dust has rained onto the white dwarf since its discovery in 2010, equal to the remains of an asteroid-size chunk of rock, or planetesimal, at least 2.5 miles (4 km) in diameter. "Fairly recently, a rocky planetesimal got too close to the white dwarf, torn apart by its enormous gravity, and formed the debris ring we see," Gänsicke told Space.com. But then, study co-author Steven Parsons at the University of Sheffield in England noticed that the white dwarf was regularly wobbling back and forth. "This immediately implied that we were not looking at a single white dwarf, but a white dwarf with a companion star," Gänsicke said. The white dwarf moved at speeds of about 89,500 mph (144,000 km/h). The strength of the gravitational pull causing this wobbling was too much for the companion to be a planet, but too little for it to be a proper star, Gänsicke said. In the solar system, the asteroid belt holds leftover building blocks from the formation of Earth and the other rocky planets. "With the discovery of asteroid debris in the SDSS 1557 system, we see clear signatures of rocky planet assembly via large asteroids that formed, helping us understand how rocky exoplanets are made in double star systems," Farihi said in the statement. "We weren't even remotely thinking about the possibility that we could find a circumbinary planetary system," Gänsicke said. "Now that we found the first one, we will have a closer look at other white dwarfs in close binaries to see if this is a one-off, or if these systems are more common." The researchers suggest this binary system had a turbulent past. They calculated that the two members of the binary system were once significantly farther from each other than they are today. However, when the progenitor of the white dwarf finished burning its hydrogen fuel, it swelled to become a red giant star, "engulfing the brown dwarf and drawing it closer towards it because of the friction in its gas envelope," Gänsicke said. Now the two members of the binary system "are about 300,000 miles [482,000 km] apart," Gänsicke said. "That's not much more than the distance between the Earth and the moon. "That rocky debris orbits this binary system is a hint that rocky planets might as well, and that such planetary systems may have survived the death of at least one member of a binary system: "SDSS 1557 adds another dimension to the possible architectures in which planetary systems can exist," Gänsicke said. Although these new findings suggest that rocky planets are forming or have formed around SDSS 1557, "detecting planets that are likely orbiting this binary further out is going to be very, very difficult," Gänsicke said. One common method used to find planets — looking for tugs on the star by a planet's gravitational pull — "is not really possible here because the white dwarf is so faint," he explained. "The other method, looking for periodic dimming as a planet crosses the star, might in principle work, but only if the orbit of such a planet is finely aligned with our line-of-sight towards the system, which is unlikely, and even then, it might take years or decades of data." "However, there is still a lot we can learn about the planetary system at SDSS1557," Gänsicke added. The researchers plan to use the Hubble Space Telescope to analyze ultraviolet light from the white dwarf, "from which we will be able to measure very accurately the chemical composition of the planetesimal that got shredded," he said. "That will tell us if it was similar to asteroids in the solar system, maybe if it had some water left, or maybe if it had a much more exotic chemical setup. And once the James Webb Space Telescope is launched, we can study the composition and size of the dust grains." "Besides that, there is a lot of theoretical work to be done — all the models for evolved planetary systems around white dwarfs were so far developed for single white dwarfs," Gänsicke said. "Now we need to ask, 'How does a planetesimal get flung near the white dwarf within the binary? How did the disruption occur? How did the dust we see now get to its location?'" The scientists detailed their findings online yesterday (Feb. 27) in the journal Nature Astronomy.